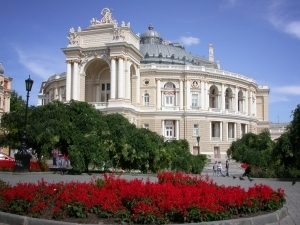 Theatrical Odessa begins its history from the moment of foundation of the city.The Opera House can be named as one of the oldest among Odessa`s cultural institutions. Odessa received the right to build the theatre in 1804 (became the third city with the theatre in Russian empire) and in 1809 it was already finished. The author of the project was famous French architect Toma de Tomon,creator of several buildings in Saint-Petersberg. Exactly this building visited A.S.Pushkin during his stay in Odessa in 1823-24. Odessa Opera House is famous first of all for its architecture and by its layout and technical qualities can compete with the best theatres in Europe. The building of the theatre in one`s time was considered the best in the world and it still remains the principal attraction of the city. The Theatre itself is interesting not only by it`s architecture, but by its rich biography. The great merit in the development of musical culture in the south of our country belongs to this theatre. Here performed actors who`s names glorified national art.Great Enriko Caruso, Feodor Shalyapin, Salomiya Krushelnitskaya, N.N.Figner and M.I.Figner, Antonina Nezhdanova, Leonid Sobinov,Juseppe Anselmi, Titta Ruffo, Mattia Battistini, L.Dzheraldoni, Michael Grishko,Arnold Azrikan sang here,the first ballet- dancer of the world —Anna Pavlova, Isidora Duncan, Ekaterina Geltser danced here. Performances and symphony concerts had been conducted by P.I.Tchaikovsky,N.A.Rimskij-Korsakov, S. V.Rakhmaninov, A. G.Rubinshtejn, E.F.Napravnik, A.S. Arensky, A.K.Glazunov, J.Grechnev, played their compositions of Ezhen Izai, Pablo Sarasate and others. 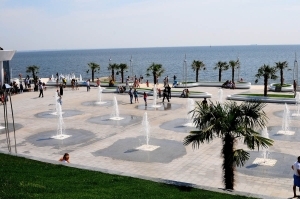 Sightseeing tour "the Pearl at the sea" You will get acquainted with the most beautiful places and sights of Odessa.Magnificent constructions, successful lay-out, soft climate and tender sea have created Odessa reputation of a great city. Throughout excursion you will visit historical places of a city:beautiful city park of T.Shevchenko where the ancient fortification is located, you will be able to see and walk on cozy streets: Pushkinskaya, Rishelevskaya, Lanzheronovskaya and Deribasovskaya, the Potemkinskaya ladder, a monument of Djuk de Rishelie, Primorsky Boulevard. You will get acquainted with an architectural masterpiece - Opera and Ballet theatre, and also historical buildings in which are located Art, Archaeological, Sea and other museums. By our excursion bus you`ll make a walk on the old areas and small streets of our city. 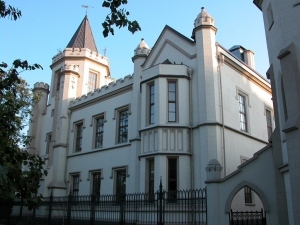 "I lived then in Odessa..." Excursion in places where the world`s famous writers such as A.Pushkin, N.Gogol, A.Mitskevich, I.Bunin, A.Kuprin, I.Babel, E.Bagritskiy, J.Olesh, K.Paustovskiy, I.Ilf and E.Petrov, V.Kataev etc. lived in or visited. The city has given to the world set of bright artists and writers.There is a number of names whole world remembers and which are closely connected with Odessa: Anna Ahmatova, Valentine Kataev, Isaak Babel, Vera Inber, Konstantin Paustovsky, Ilya Ilf, Evgenie Petrov, Edward Bagritsky, Michael Zhvanetsky. They have embodied on pages of their works bright instants of city history, its labor, cultural, literary life, traditions, customs - all that forms of "local color". During excursion you will visit Literary museum where documents, books, manuscripts and other relics concerning the right time of their stay in Odessa are stored. By the way, in a museum court yard every year the new monument devoted to unique Odessa characters, known under stories, jokes and songs "for Odessa" - to Rabinovich, Odessa-mum, Odessa`s Mishka, jean Djuk on April 1st, etc. Then you`ll visit A.S.Pushkin's museum-apartment. 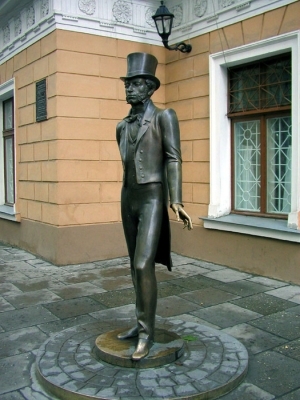 For thirteen months in Odessa of a Pushkin's exile he creates a poem "Gipsies", the poem "Bakhchsarai fountain" is finished, writes thirty lyrics and two and a half head of the novel "Evgenie Onegin". 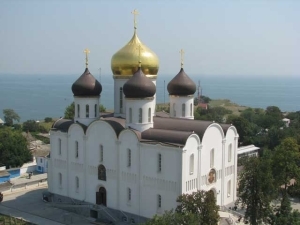 "Temples of Odessa" Excursion with visiting of churches of different religious faiths (the Uspensky cathedral, the Greek church, the Armenian church, the synagogue, functioning man's and female`s monasteries). Our excursion will familiarize you with the religious past and present of the city . You will visit the Uspensky monastery where the Theological seminary is located where now about 700 seminarists study. Visit the church of Sacred Maria Magdalina revived in 1998 , the Greek and the Armenian churches. During excursion you will be told about birth, destruction and revival of numerous Odessa temples, stories of the Odessa relics, about creative works of modern icon painters and much many other things. Certainly, Odessa – is a city of great orthodox relics. In orthodox temples and monasteries wonder-working icons shine, exhale healing sacred hallows of the saints glorified by Church Divine. "Secrets of the Odessa catacombs" Excursion to the greatest in the world - the Odessa catacombs. Their history is connected with history of Odessa. Smugglers and thieves, revolutionaries and guerrillas, cave explorers found shelter in them. The Odessa catacombs - the greatest in the world underground labyrinths located under Odessa and its vicinities. The history of their occurrence throws back to the centuries: the stone - a shell rock for building was extracted here by ancient Slavs. The most ancient element of the Odessa catacombs - karstic caves - has arisen more than 3,7 million years ago. Other types of underground cavities were formed much later, not earlier than the beginning of 19 centuries,in that time underground extraction of a stone - a shell rock of which houses in old Odessa were built from.Labyrinths of Odessa catacombs are stretched under the city and its suburbs on 2,5 thousand of km. What is famous about the Odessa catacombs? In difficult days of city history vaults helped its inhabitants. In days of Civil war they covered revolutionaries from punishment of Imperial Russia; vaults, have served as a refuge and a headquarters of the guerrilla during the Great Patriotic War. Nowadays in village Nerubajsky the memorial complex and an underground Museum of guerrilla Glory is created. 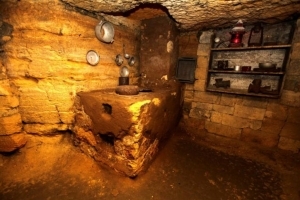 During excursion you will visit these objects, will pass with a guide through catacombs, will see the coal drawings of miners made more than 100 years ago and so-called miner's wells , mysterious signs of Masons and modern "petroglyphic painting". «Palaces of Odessa» Ekaterina's Second favourite, Odessa was raised under guidance of the best European architects. Architects of all Europe realized their dreams in projects of building of a city. And because of this Odessa has a lot of unique Palaces each having history, not less interesting, than stories of the life of their creators.